Wendy’s advertises its new Parmesan Caesar Chicken Salad in a hilarious new commercial. 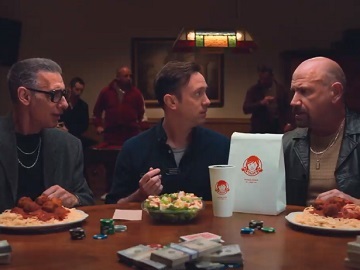 The 30-second spot features a man eating the Wendy’s Parmesan Caesar Chicken Salad at a table where several other men, who apparently belong to a gang, are playing poker with plates filled with spaghetti and meatballs in front of them. When the guy says “This Wendy’s salad’s really good,” they start questioning the meaning behind this sentence, which gets him in serious trouble. “What’s that supposed to mean? ‘This Wendy’s salad is really good’?” The salad guy explains that it tastes good, but his answer is met with skepticism. “No, we don’t know. Cause salads don’t taste good,” one of the gang members says, asking him if that’s a signal or something and if he’s wearing a wire. Believed to be a spy, he is then taken away even though he’s trying to point out that Wendy’s new Parmesan Caesar Chicken Salad is really good. The commercial ends with the voiceover urging viewers to try Wendy’s new Parmesan Caesar Chicken Salad, which is just one of many made fresh every day. “It’s a salad, but good,” he also adds. Eventually, it turns out the guy was really a spy whose colleague in the van parked nearby is also eating a Parmesan Caesar Chicken Salad and proclaims that it is indeed really good. The Parmesan Caesar Chicken Salad is the latest addition to the chain’s salad menu, which also includes Harvest Chicken Salad, Taco Salad, Apple Pecan Chicken Salad, Southwest Avocado Chicken Salad, Garden Side Salad, and Caesar Side Salad.